In this month’s Oxford World’s Classics reading list, we decided to celebrate National Short Story Month by selecting some of favourite story collections. We have everything here from Gaskell to Cervantes, Fitzgerald to Kafka. But have we missed your favourite? Let us know. While Cervantes is best known for Don Quixote, he also wrote stories, which were actually much more popular in his day than the larger work. The Exemplary Stories range from the picaresque to the satirical, and skilfully draw on colloquial language and farce to create a tension between the everyday and the literary. While Cervantes wants his readers to reach their own moral conclusions, he also paints vivid pictures of the coincidental and the incredible, such as a young nobleman undergoing a change of identity at the behest of a gipsy girl, and two young boys indulging in a life of crime. There are also talking dogs philosophizing in a ward full of syphilitics… and who doesn’t want to read that? Everyone knows that Fitzgerald wrote The Great Gatsby (especially after the release of Baz Luhrmann’s film) but he was also a short story writer. Tales of the Jazz Age was his second short story collection, and it contains some of the best examples of his talent as a writer of short fiction. These stories demonstrate the same originality and inventive range as his great novels, as he chronicles the hedonistic 1920s. This collection contains two of his greatest stories, ‘May Day’ and ‘The Diamond as Big as the Ritz’. Elizabeth Gaskell has long been one of the most popular of Victorian novelists, yet in her lifetime her shorter fictions were just as admired as North and South or Wives and Daughters. This edition’s title story, Cousin Phillis, is a lyrical depiction of a vanishing way of life and a girl’s disappointment in love. The other five stories were all written during the 1850s for Dickens’s periodical Household Words. They range from a quietly original tale of urban poverty and a fallen woman in ‘Lizzie Leigh’ to an historical tale of a great family in ‘Morton Hall’; echoes of the French Revolution, the bleakness of winter in Westmorland, and a tragic secret are brought vividly to life. Enigmatic, satirical, often bleakly humorous, these stories approach human experience at a tangent: a singing mouse, an ape, an inquisitive dog, and a paranoid burrowing creature are among the protagonists, as well as the professional starvation artist. A patient seems to be dying from a metaphysical wound; the war-horse of Alexander the Great steps aside from history and adopts a quiet profession as a lawyer. Fictional meditations on art and artists, and a series of aphorisms that come close to expressing Kafka’s philosophy of life, further explore themes that recur in his major novels. Virginia Woolf was a keen admirer of Katherine Mansfield’s work, saying it was “the only writing I have ever been jealous of”. Other admirers included Thomas Hardy, D. H. Lawrence, and Elizabeth Bowen. Our edition of her Selected Stories covers the full range of Mansfield’s fiction, from her early satirical stories to the nuanced comedy of ‘The Daughters of the Late Colonel’ and the macabre and ominous ‘A Married Man’s Story’. Ranging between Europe and her native New Zealand, disruption is a constant theme, whether the tone is comic, tragic, nostalgic, or domestic, echoing Mansfield’s disrupted life and the fractured expressions of Modernism. Oscar Wilde was already famous as a wit and raconteur when he first began to publish his short stories in the late 1880s. The stories are full to the brim with Wilde’s originality, literary skill, and sophistication. They include poignant fairy-tales such as ‘The Happy Prince’ and ‘The Selfish Giant’, and the extravagant comedy and social observation of ‘Lord Arthur Savile’s Crime’ and ‘The Canterville Ghost’. They also encompass the daring narrative experiments of ‘The Portrait of Mr. W. H.’, Wilde’s fictional investigation into the identity of the dedicatee of Shakespeare’s sonnets, and the ‘Poems in Prose’, based on the Gospels. While ‘Decadence’ was a movement that swept most of Europe, its epicentre was Paris. On the eve of Freud’s early discoveries, writers such as Gourmont, Lorrain, Maupassant, Mirbeau, Richepin, Schwob, and Villiers engaged in a species of wild analysis of their own, perfecting the art of short fiction as they did so. Their stories teem with addicts, maniacs, and murderers as they strive to outdo each other. 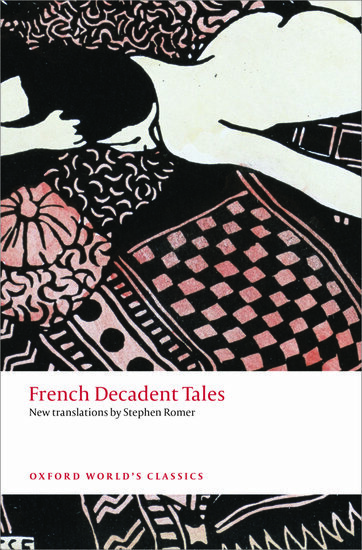 This selection of tales includes well-known writers such as those mentioned above, as well as lesser known figures such as Léon Bloy, Jean Richepin, and the Belgian Georges Rodenbach. Kirsty Doole is Publicity Manager for Oxford World’s Classics, amongst other things. For over 100 years Oxford World’s Classics has made available the broadest spectrum of literature from around the globe. Each affordable volume reflects Oxford’s commitment to scholarship, providing the most accurate text plus a wealth of other valuable features, including expert introductions by leading authorities, voluminous notes to clarify the text, up-to-date bibliographies for further study, and much more. You can follow Oxford World’s Classics on Twitter and Facebook. Image credit: Portrait of Katherine Mansfield (1918). By Anne Estelle Rice [Public domain], via Wikimedia Commons.